FDA Safety Study of Unloading the Left Ventricle for 30 Minutes Prior to Reperfusion in Heart Attack Patients is Safe and Feasible | ABIOMED, Inc.
CHICAGO--(BUSINESS WIRE)--Nov. 11, 2018-- Abiomed (NASDAQ: ABMD) announces the results of the FDASTEMI Door-to-Unloading safety and feasibility randomized controlled trial, which show unloading the left ventricle with Impella CP® for 30 minutes prior to reperfusion in patients presenting with anterior ST-segment elevation myocardial infarction (STEMI) without cardiogenic shock is safe and feasible, when compared to Impella patients reperfused immediately. The results of the prospective, 50 patient, randomized, multi-center trial were presented today by Navin Kapur, MD, executive director of the CardioVascular Center for Research and Innovation at Tufts Medical Center, at the American Heart Association Scientific Sessions 2018 in Chicago. They were simultaneously published in Circulation. Dr. Kapur and William O’Neill, MD, medical director of the Center for Structural Heart Disease at Henry Ford Hospital in Detroit are co-principle investigators of the study. Unloading first and delaying reperfusion by 30 minutes did not increase 30-day major adverse cardiovascular and cerebrovascular events (MACCE) or infarct size, compared to the immediate reperfusion arm of the trial. Infarct size is a measure of damage to the heart muscle after a heart attack. It is feasible to delay reperfusion in a heart attack (STEMI) patient in a clinical trial, as demonstrated by a 100% adherence to the 30 minute unloading protocol and 100% Impella CP insertion success in both study arms. Unloading the left ventricle for 30 minutes prior to reperfusion appears to reduce infarct size as a percentage of area at risk among patients with a ST sum greater than 6. Abiomed also announces that, in agreement with the FDA, it will move forward with a pivotal, multi-center, prospective, randomized controlled trial comparing unloading with delayed reperfusion to the current standard of care (immediate reperfusion without Impella). The pivotal trial is planned to begin next year. “This safety and feasibility study gives us hope that we can help STEMI heart attack patients in the future by unloading the heart muscle with delayed revascularization. The planned pivotal randomized controlled trial will further examine whether unloading with Impella CP for 30 minutes prior to reperfusion will potentially slow down or avoid the development of heart failure,” said Dr. O’Neill. “We would like to thank the FDA, our dedicated employees, the patients who consented and all the investigators for their efforts to successfully complete this milestone. We look forward to the pivotal study and expanding the clinical science for the field of heart recovery," said Michael R. Minogue, chairman, president, and chief executive officer of Abiomed. The safety and feasibility study design was approved by the FDA, with an independent steering committee and data and safety monitor overseeing the trial and a blinded clinical events committee independently adjudicating study endpoints. Infarct size was evaluated using a cardiac magnetic resonance imaging technique assessed at a blinded core lab. The trial was sponsored by Abiomed. Abiomed will discuss the trial results with investors during a short call on Monday, November 12 at 8:00am EST. To listen to the call live, please tune into the webcast via http://investor.abiomed.com or dial (855) 212-2361. The international number is (678) 809-1538. The access code is 808 3207. STEMI is a type of heart attack caused by a blockage in one of the main heart arteries, preventing the flow of oxygen to the heart. It is estimated that 965,000 people a year have heart attacks1, of which approximately 200,000 are classified as STEMI2. The current standard of care is sometimes called Door-to-Balloon "DTB", for the goal of minimizing the time it takes an interventional cardiologist to deploy an angioplasty balloon to open the patient’s blocked artery. The recommended treatment in guidelines for STEMI is revascularization (opening the blocked artery) to restore blood flow and oxygen supply to the heart muscle through primary percutaneous coronary intervention (PCI) within 90 minutes or less from the time of first medical contact. 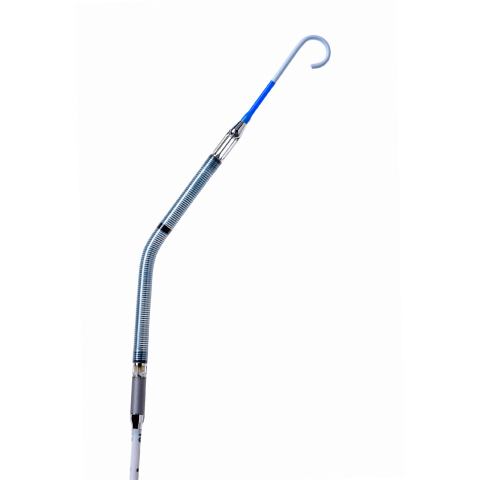 Impella® heart pumps are not FDA approved for use in STEMI patients without cardiogenic shock. 1. "Heart Disease and Stroke Statistics 2016 Update: A Report from the American Heart Association Statistics Committee and Stroke Statistics Subcommittee." (Circulation. 2016; 133(4); 38-360). 2. "Recent Trends in the Incidence, Treatment, and Outcomes of Patients with ST and Non-ST-Segment Acute Myocardial Infarction," (Am. J. Med. 2011; 124(1); 40—47).